Under the management of the Corporation of the City of London, London’s markets are a crucial cog in the wheel of life in our great city. This year’s Master, Robert Woodthorpe-Browne, was keen to understand their role in more detail with a series of visits. The number for this visit was limited to twelve and the seven o’clock start meant that it was a select group of early-rising World Traders that gathered at New Spitalfields located between Stratford and Leyton in East London. The market operates from midnight so by the time we had our tour most of the buyers had been and gone. Nevertheless there was still enough activity to provide a fascinating insight into the operations of this biggest produce market in the UK. The original Spitalfields goes back to the 13th Century and the market buildings north of the City were run by the City of London Corporation as a produce market for sixty years from 1920. New Spitalfields has been on its present 31-acre site for 27 years. With the accelerating pace of change, increasing demand for imported exotic produce, environmental pressures relating to waste and transport infrastructure, how long will it be before we are visiting a new New Spitalfields? 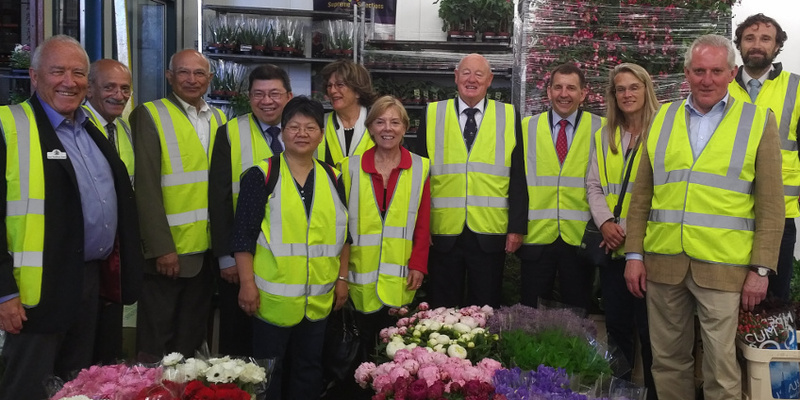 We are most grateful to Jan Hutchinson, CEO of the Market Tenants’ Association and Ben Milligan, Market Superintendent, who generously gave us their time, hospitality and extensive knowledge.